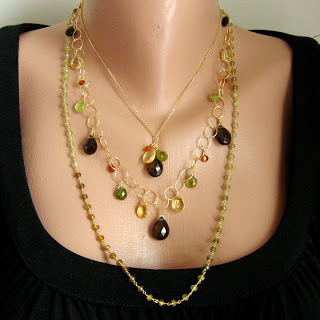 I posted photos of the initial members of my Facets line, heading shortly to Simply Charming Boutique. Once I started working with gold again it made sterling seem kind of boring, so there are more gold pieces than silver. Maybe it’s because gold is just perfect for fall and I have a hankering for cool weather and crunchy leaves. 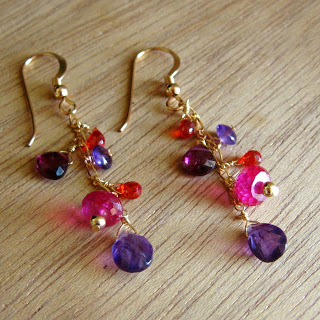 The Facets collection includes genuine faceted stones like garnet (grossular green, brown hessonite, traditional almandine, pink rhodolite), citrine (both pale and topaz-y deep), burnt orange carnelian, amethyst, apatite, iolite, smoky quartz, and did I mention gold! I used a lot of gold-fill components, which is a heavy layer of 12-14K gold over a base metal core. It has the look and durability of 14 karat gold without the $1,297/oz price tag. I also used some vermeil (ver-MAY), which is a sterling silver base heavily plated with high-karat (18-22K) gold so it is solid precious metal and has that rich yellow color like museum jewelry. I love the way it looks with pink, orange, and purple. Simply Charming Boutique has reopened in its new location (with free parking) and I can’t tell you in words how BEAUTIFUL it is! My jaw dropped open when I first walked in, partly because it’s an old building with wonderful architectural details, and partly because Brenda has filled it with all kinds of wonderful things. Go have a look if you’re near Winchester, Virginia! If you’re not lucky enough to be in the Shenandoah Valley but you want to get details about the pieces, feel free to email me for pricing and availability of any items in the Facets or Elements collections, or you can check out the rest of my jewelry at my Etsy shop.